There will be a day when a composer will compose music with a notation that will be conceived in terms of music and light… and that day, the artistic unity we were talking about will probably be closer to perfection.., Vladimir Baranoff-Rossiné, 1925. (Colour) pianos (or organs) were constructed by the likes of Alexander Scriabin (with Preston Millar), Vladimir Baranoff-Rossiné, Alexander László, and Zdeněk Pešánek (with Erwin Schulhoff) in an attempt to navigate between musical and visual realms. Scriabin composed a color-music piece Prometheus: The Poem of Fire (1911) and contracted Preston Millar to build an instrument to produce colors along to the music, named Chromola (Clavier à lumières; tastiéra per luce; keyboard with lights). Futurist painter Baranoff-Rossiné's instrument introduced patterns and shapes into a color organ, built upon a modern piano, thus called the Optophonic Piano (Piano optophonique). The piano projected light through painted and rotating glass plates, whose colors, shapes and rhythms closely complemented the music (1916, developed since 1912); it was presented in the Theatre of Vsevolod Meyerhold, at his exhibition in Kristiana in Oslo (1916), and in the Bolshoi Theater in Moscow (1924). Baranoff-Rossiné performed until the late 1920s, but his work was displayed in several museums in Europe and the US from 1966 to 1975. With their Spectrophon-Piano (1928), Pešánek and Schulhoff attempted to create an audio-visual sculpture. The piano enabled the dynamic synthesis of music and coloured light in performances in big concert halls. Alexander László, Die Farblichtmusik, Leipzig: Breitkopf & Härtel, 1925, xii+71 pp. Teun Lucassen, "Color Organs", n.d.
Jörg Jewanski, "Color Organs", See This Sound Compendium, c2010. "Bibliography: Synesthesia in Art and Science", comp. Crétien van Campen (editor), Greta Berman, Anton V. Sidoroff-Dorso and Bulat Galeyev, Leonardo, 2012. 1910s-20s: Wassily Kandinsky (Moscow/Weimar), Kazimir Malevich (Moscow/St. Petersburg), Naum Gabo (Moscow/Berlin), Vladimir Tatlin (Moscow), El Lissitzky (Moscow/St. Petersburg/Vitebsk), Alexander Rodchenko (Moscow), Varvara Stepanova (Moscow), Karl Ioganson (Moscow), Stenberg brothers (Moscow), Aleksei Gan (Moscow), Lajos Kassák (Budapest), László Moholy-Nagy (Berlin/London), Leon Chwistek (Krakow/Lwow), Stanisław Ignacy Witkiewicz (Warsaw), Anatol Stern (Warsaw), Karel Teige (Prague), Josef Vydra (Bratislava), Jaromír Funke (Prague/Bratislava), Henryk Berlewi (Warsaw/Berlin/Paris), Ljubomir Micić (Zagreb/Belgrade), Josip Seissel (Jo Klek; Zagreb), Ion Vinea (Bucharest), Marcel Janco (Bucharest), Victor Brauner (Bucharest/Paris), Władysław Strzemiński (Warsaw/Łódź), Katarzyna Kobro (Warsaw/Łódź), Mieczyslaw Szczuka (Warsaw), Avgust Černigoj (Trieste/Ljubljana), Ferdo Delak (Ljubljana), Vytautas Kairiūkštis (Vilnius), Jaan Vahtra (Tartu). Second Spring Exhibition of OBMOKhU, Moscow, May-Jun 1921. Congress of International Progressive Artists, Düsseldorf, May 1922. L-R: unknown boy, Werner Graeff, Raoul Hausmann, Theo van Doesburg, Cornelis van Eesteren, Hans Richter, Nelly van Doesburg, unknown (De Pistoris? ), El Lissitzky, Ruggero Vasari, Otto Freundlich (? ), Hannah Höch, Franz Seiwert and Stanislav Kubicki. 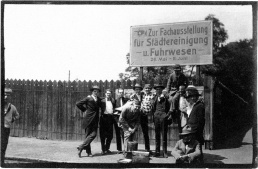 Congress of the Constructivists and Dadaists, Weimar, Sep 1922. Top-bottom L-R: 1st row: Lucia Moholy, Alfréd Kemény, László Moholy-Nagy. 2nd row: Lotte Burchartz, El Lissitzky, Cornelis van Eesteren, Bernhard Sturtzkopf. 3rd row: Max Burchartz, Harry Scheibe, Theo van Doesburg (with paper hat), Hans Vogel, Peter Röhl. 4th row: Alexa Röhl, Nelly van Doesburg, Tristan Tzara, Sophie Taeuber, Hans Arp. 5th row: Werner Graeff and Hans Richter. Stedelijk. Second Spring Exhibition of OBMOKhU in Moscow, May-June 1921. Several weeks earlier, in March 1921, five of the exhibiting artists (Rodchenko, Ioganson, Stenberg brothers, Medunetsky) formed together with Stepanova and Gan the First Working Group of Constructivists at the Moscow Institute of Artistic Culture (INKhUK). The Congress of International Progressive Artists [Kongress der Union Internationaler Fortschrittlicher Künstler] in Düsseldorf on 29-31 May 1922. Formation of the International Faction of Constructivists was organised by van Doesburg (representing the journal De Stijl), Richter (representing 'the Constructivist groups of Romania, Switzerland, Scandinavia and Germany') and Lissitzky (representing the editorial board of Veshch'-Gegenstand-Objet). The faction's declaration was later published in De Stijl (no. 4, 1922). 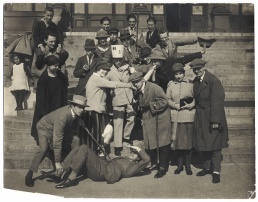 Congress of the Constructivists and Dadaists, Weimar, 25-26 September 1922. The First Russian Art Exhibition [Erste russische Kunstausstellung] opened at Galerie van Diemen in Berlin on 15 October 1922, with over 1,000 objects by c180 artists: 237 paintings, more than 500 graphic works, sculptures, as well as designs for theater, architectural models, and porcelain. The exhibition's official host was the Russian Ministry for Information, and it was put together by the artists Gabo, David Sterenberg, and Nathan Altman. Version of the exhibition later travelled to Stedelijk Museum, Amsterdam, in April-May 1923. New Art Exhibition [Wystawa Nowej Sztuki], organised by Strzemiński and Kairiūkštis in Vilnius on May-June 1923. The works included painting, drawing, sculpture, architecture, scenography, and print; cubist, constructivist, and suprematist compositions predominated. The 7 exhibiting artists went on to form the Blok collective. The Block of Cubists, Constructivists and Supermatists [Blok Kubistów, Suprematystów i Konstruktywistów], an exhibition of Blok at the Laurin & Clement car dealer's shop in Warsaw, March 1924. Works by 9 artists. First Zenit International Exhibition of New Art [Прва Зенитова међународна изложба нове уметности], organised by Micić in April 1924 in Belgrade. Featured one hundred works advertised as "futurism, cubism, expressionism, ornamental cubism, suprematism, constructivism, neoclassicism and the like". The First Contimporanul International Exhibition organised by Contimporanul magazine in November 1924 in Bucharest brought together the Romanian avant-garde along with international artists. The a.r. International Collection of Modern Art, donated by a.r. group to the Municipal Museum of History and Art (now Museum of Art; Museum Sztuki) in Łódź, opened to the public in February 1931. It included 111 works and represented - as no other contemporary European collection had done - the main movements of avant-garde art, from Cubism, Futurism and Constructivism, through Purism and Surrealism, to Neo-Plasticism, Unism and Formism. 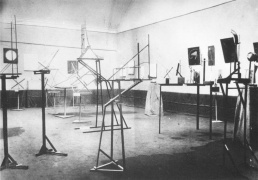 The Constructivists [Die Konstruktivisten] exhibition at Kunsthalle Basel, Jan-Feb 1937. Poster. Review. The Planar Dimension: Europe, 1912-1932, Guggenheim Museum, New York, 1979. Curated by Margit Rowell. Catalogue published. Europa, Europa. Das Jahrhundert der Avantgarde in Mittel- und Osteuropa, Kunst- und Ausstellungshalle der Bundesrepublik Deutschland, Bonn, 27 May - 16 October 1994. Large-scale exhibition with constructivist section. 4-volume catalogue published. Central European Avant-Gardes, Los Angeles County Museum of Art, 2002. Curated by Timothy O. Benson. Large-scale exhibition with constructivist section. Catalogue published: TOC. Von Kandinsky bis Tatlin: Konstruktivismus in Europa/From Kandinsky to Tatlin: Constructivism in Europe, Staatliches Museum, Schwerin, and Kunstmuseum, Bonn, 2006. Catalogue published. Günter Berghaus (ed. ), Futurism in Eastern and Central Europe, De Gruyter (International Yearbook of Futurism Studies 1), 2011. Sarah Posman, Anne Reverseau, David Ayers, Sascha Bru, Benedikt Hjartarson (eds. ), The Aesthetics of Matter. Modernism, the Avant-Garde and Material Exchange, De Gruyter, 2013. Avant-garde in Hungary, Poland, Czech Republic, Slovakia, Croatia, Serbia, Slovenia, Romania, Estonia, Latvia, Lithuania. Further bibliography. Photography in Czech Republic, Slovakia. Łukasz Ronduda, Florian Zeyfang (eds. ), 1,2,3 -- avant-gardes : film, art between experiment and archive, Centre for Contemporary Art, Warsaw ; Berlin ; New York : Sternberg, 2007. Experimental film in Hungary, Poland, Czech Republic, Slovakia, Croatia, Serbia, Slovenia, Bosnia and Herzegovina, Romania, Estonia, Lithuania. Further bibliography. Tadeusz Kantor (1915-90 Kraków), Alina Szapocznikow (1926-73 Poland/Paris), Geta Brătescu (1926 Bucharest), Włodzimierz Borowski (1930-2008 Warsaw), Jerzy Bereś (1930-2012 Kraków), Ilija Šoškić (1934 Montenegro/Rome), Tomislav Gotovac (1937 Zagreb), Natalia LL (1937 Wrocław), Zbigniew Warpechowski (1938 Kraków), Milan Knížák (1940 Prague), Karel Miler (1940 Prague), György Galántai (1941 Budapest), Jana Želibská (1941 Bratislava), Zorka Ságlová (1942-2003 Prague), Katalin Ladik (1942 Novi Sad/Budapest), Grzegorz Kowalski (1942 Warsaw), Tamás Szentjóby (1944 Budapest), Petr Štembera (1945 Prague), Raša Todosijević (1945 Belgrade), Ion Grigorescu (1945 Bucharest), Zofia Kulik (1947 Warsaw) & Przemyslaw Kwiek (1945 Warsaw), Ewa Partum (1945 Warsaw), Marina Abramović (1946 Novi Sad/Amsterdam/New York), Sándor Pinczehelyi (1946 Pécs/Budapest), Tibor Hajas (1946-80 Budapest), Ľubomír Ďurček (1948 Bratislava), Sanja Iveković (1949 Zagreb), Ján Budaj (1952 Bratislava), Jan Mlčoch (1953 Prague), Jiří Kovanda (1953 Prague), Vladimír Havlík (1959 Olomouc), Łódź Kaliska (1979-, Łódź), Orange Alternative (1983-, Wrocław), Autoperforationsartistik (1980s, Dresden). Dalibor Chatrný (1925-2012 Brno), Miklós Erdély (1928-86 Budapest), Włodzimierz Borowski (1930-2008 Warsaw), Vladan Radovanović (1932 Belgrade), Alex Mlynárčik (1934 Bratislava/Prague/Paris), Gábor Attalai (1934 Budapest), László Lakner (1936 Budapest/Berlin), Marek Konieczny (1936 Warsaw), Dóra Maurer (1937 Budapest), Endre Tót (1937 Budapest/Cologne), Stano Filko (1937-2015 Bratislava), Peter Bartoš (1938 Bratislava), Július Koller (1939 Bratislava), György Jovánovics (1939 Budapest), Milan Knížák (1940 Prague), Gyula Pauer (1941 Budapest), Krzysztof Wodiczko (1943 Warsaw/New York/Boston), Tamás Szentjóby (1944 Budapest), Jarosław Kozłowski (1945 Poznań), Jiří Valoch (1946 Brno), J.H. Kocman (1947 Brno), Braco Dimitrijević (1948 Sarajevo/Zagreb/Paris), Goran Trbuljak (1948 Zagreb), Goran Đorđević (1950 Belgrade/New York). Slovakia, Hungary, Romania. Further bibliography. Audiovisual compositions in Czech Republic, Slovakia. Further bibliography. See Computing and cybernetics in CEE. Lev Termen, the patriarch of musical electronics, a talented physicist, created Aetherophone (later called the Theremin or Thereminovox) in 1920 - unsurpassed till now in the family of performing electronic instruments (owing to its keen sound control options). Other early instruments include Sonchromatoskop by Sándor László (1920), Sonar by N.Anan'yev (c1930), Ekvodin by V.A.Gurov (1931), Emiriton by A.Ivanov and A.Rimsky-Korsakov (1932). While in the United States, Termen also created Theremin Cello (electric Cello with no strings and no bow, using a plastic fingerboard, a handle for volume and two knobs for sound shaping, c1930), Theremin keyboard (a piano-like device, c1930), Rhythmicon (world's first drum machine, 1931), and Terpsitone (platform that converts dance movements into tones, 1932). In the 1930s, professor E.A.Sholpo established a laboratory for sound synthesis where he developed his Variophone (1932), a precursor of the synthesizers. A.A.Volodin, a scientist in the field of electronic sound synthesis, designed a whole series of new instruments. Warsaw Autumn Festival initiated by Baird and Serocki presented since 1956 works by Berg, Schönberg, and Bartók; Stockhausen and Schaeffer visited. Polish Radio Experimental studio was founded by Patkowski in 1957. In Czechoslovakia, the first representative Seminar on Electronic Music, organized on the initiative of several Czech and Slovak composers, musicologists and sound technicians, was held at the Research Institute of Radio and Television in Pilsen in 1964. It appeared a miracle to many people interested in this kind of musical creativity. The seminar dealt seriously and manifestly with questions of electronic music, for the first time in Czechoslovak cultural context. The representative survey on electronic music written by Czech musicologist Vladimir Lebl and published in 1966 was the fundamental theoretical work, followed by his translation of the book "La Musique concrète" by Pierre Schaeffer. Several compositions by the classicists of concrete, tape and electronic music appeared in radio broadcasts in 1965 and the first LP with electronic music pieces by both inland and foreign composers was published as soon as in 1966. Followed by foundation of experimental music studios in Bratislava (1965) and Pilsen (1967). During 1950s-70s the number of composers visited New Music courses in Darmstadt (Kotonski, Piňos, Jeney, Sáry), studied and worked with studios WDR Cologne (Kotonski, Eötvös, Dubrovay), GRM Paris (Kotonski, Kabeláč, Piňos, Vidovszky), Munich (Piňos), STEM Utrecht (Kabeláč), or IRCAM Paris (Eötvös). Gorizont became known as some sort of Russian version of Kraftwerk, releasing an LP by the "Soviet State" record label Melodia. 1950s-60s: Warsaw Autumn Festival (Warsaw, *1956), International Seminars on New Music (Smolenice, 1968-70), Exposition of Experimental Music (Brno, 1969-70). 1990s: Evenings of New Music (Bratislava, *1990), IFEM and FEM festival (Bratislava, 1992-96), Exposition of New Music (Brno, *1993). Unearthing The Music: Creative Sound and Experimentation under European Totalitarianism, a research project led by Out.ra association, 2017ff. Lejaren A Hiller, Report on Contemporary Music, 1961 (Technical Report no. 4), Urbana, Il. : Experimental Music Studio, University of Illinois, 1962. David Crowley, Daniel Muzyczuk, Sounding the Body Electric: Experiments in Art and Music in Eastern Europe 1957-1984, Lodz: Muzeum Sztuki, 2012. Daniel Muzyczuk, David Crowley, Michał Libera, "Sounding the Body Electric: A Conversation", ArtMargins, 8 October 2012. Electroacoustic music in East Germany, Poland, Slovakia, Czech Republic, Hungary, Serbia, Croatia, Romania, Bulgaria, Lithuania, Latvia, Estonia. Further bibliography. See also Audiovisual tools and instruments, Electronic art music, The International Documentation of Electroacoustic Music and . 1950s-60s: Josef Svoboda's Laterna Magika, Diacran, Polyecran, and Diapolyecran (Prague), Jaroslav Frič's Polyvision and Vertical Cinemascope (Prague), Dvizheniye group's Cybertheatre (Moscow, incl. Lev Nusberg and Francisco Infante), Stano Filko's Cathedral of Humanism (Bratislava), Jerzy Rosołowicz's Neutrdrom (Wroclaw), VAL group's Heliopolis (Bratislava), Jana Želibská's The Possibility of Exposure (Bratislava). David Crowley, "The Art of Cybernetic Communism", 2011. Multimedia environments in Czech Republic, Hungary. Further bibliography. Margit Rosen (ed. ), A Little-Known Story About a Movement, a Magazine, and the Computer’s Arrival in Art: New Tendencies and Bit International, 1961-1973, The MIT Press, Cambridge, MA, 2011. Computer art in Czech Republic, Slovakia, Hungary, Poland, Croatia, Slovenia, Serbia, Romania, Bulgaria. Further bibliography. Video in Hungary, Poland, Czech Republic, Slovakia (2), Croatia, Serbia, Slovenia, Romania, Bulgaria, Estonia, Lithuania. Further bibliography. The Media Are With Us conference (Budapest, 1990), Ostranenie (Dessau, 1993/95/97/99), Orbis Fictus exhibition (Prague, 1994), Hi-tech/Art exhibition and symposium series (Brno, 1994-97), MetaForum conferences (Budapest, 1994-96), Butterfly Effect (Budapest, 1996), Dawn of the Magicians? (Prague, 1996-97), LEAF conference (Liverpool, 1997), Beauty and the East Nettime conference (Ljubljana, 1997), Communication Front (Plovdiv, 1999-2001), Media Forum (Moscow, *2000), Enter Multimediale festival (Prague, 2000/05/07/09), Multiplace festival (Bratislava/Prague/Brno/international, *2002), FM@dia (Prague, 2004), Trans european Picnic (Novi Sad, 2004), Remake exhibition (Brno/Bratislava/Cluj, 2012). Third Text (*1987, int), Springerin magazine (*1995, Vienna), IDEA Arts+Society magazine (*1999, Cluj), ARTMargins (*1999, int), EIPCP (and Transversal journal, *2000, Vienna), Prelom magazine (*2001, Belgrade), Tranzit (*2002, Vienna, Prague, Bratislava, Budapest, Bucharest), Chto delat (*2003, Moscow, St Petersburg), Artyčok (*2005, Prague), Translit journal (*2005, St Petersburg), Former West (*2008, int). The first phase of this research (2009-11) was supported by cOL-mE, International Visegrad Fund, and ERSTE Foundation. Contributors include Dušan Barok, Guy van Belle, Nina Czegledy, Lenka Dolanová, Eva Krátká, Magdaléna Kobzová, Barbora Šedivá, Joanna Walewska, Darko Fritz, Miro A. Cimerman, Matko Meštrović, Paul Stubbs, Rarita Szakats, Călin Man, Raluca Velisar, Miklós Peternák, János Sugár, Pit Schultz, Diana McCarty, Barbara Huber, Maxigas, Miloš Vojtěchovský, Grzegorz Klaman, František Zachoval, Sølve N.T. Lauvås, and many others. This page was last modified on 10 October 2018, at 16:35. This page has been accessed 307,435 times.